This home honors the “Arts and Crafts” or “Prairie” style that is often identified with Frank Lloyd Wright. It incorporates low horizontal lines and open interior spaces, along with the use of simple forms and natural materials. Within this style, there is a celebration of handicrafts. 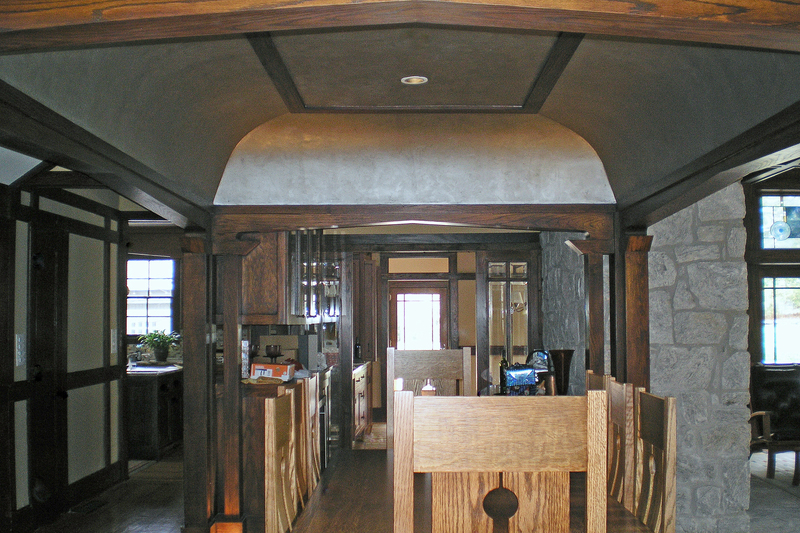 Open floor plans utilize unique ways to divide spaces with the use of stained glass, beamed ceilings, and dark wood outlines. Clean lines offer a contemporary backdrop to feature exceptional artistic details. 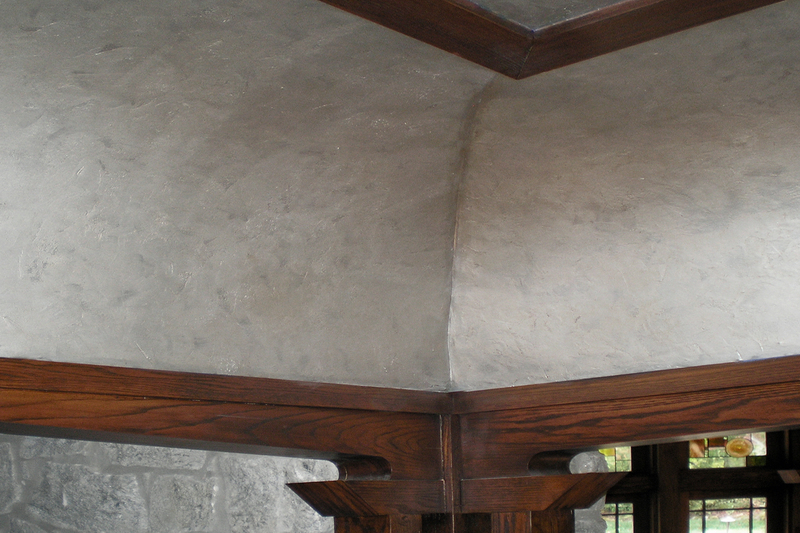 All of the elements were already in place to respect the Arts and Crafts style of this home. Changing the dining room ceiling captured even more features that would be consistent. The color and texture needed to complement the stone wall, emphasize clean lines and celebrate artistic details. Keeping the color values close offers a seamless visual line between the rock wall and the ceiling. The new twist is that a subtle reflective faux finish has been added in place of the blue. It is an elegant metallic during the day. At night, it comes alive as light is allowed to dance across the shimmering surface. This provides a beautiful backdrop that features the sleek light fixture and allows the dark wood to outline and define the space. 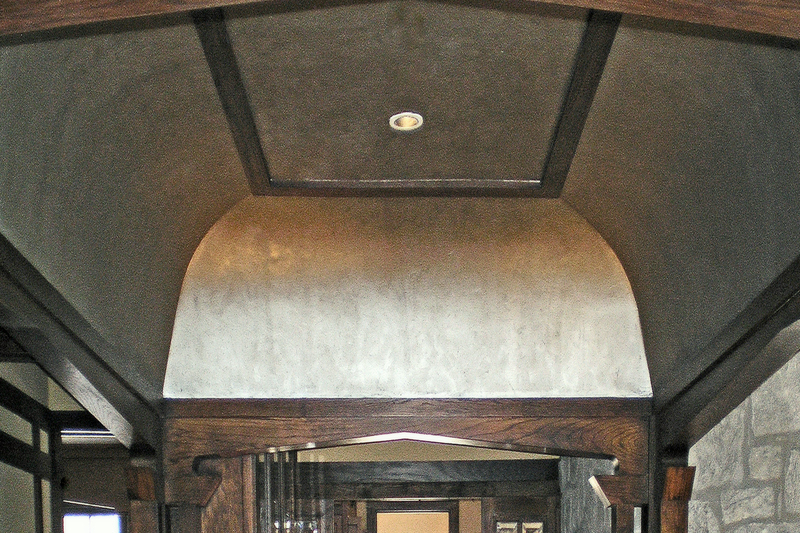 The ceiling now creates the simplicity and sophistication needed to respect the intentions of this architectural style. Frank would be proud! Special thanks to designer, Karen Davis of KD Design Studio (678-965-5507). 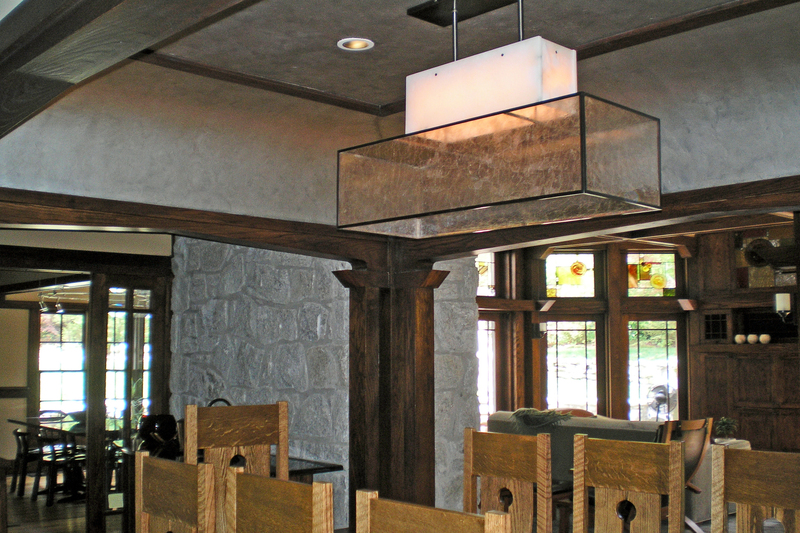 For more innovative transformations, visit our Faux Finish Projects page. 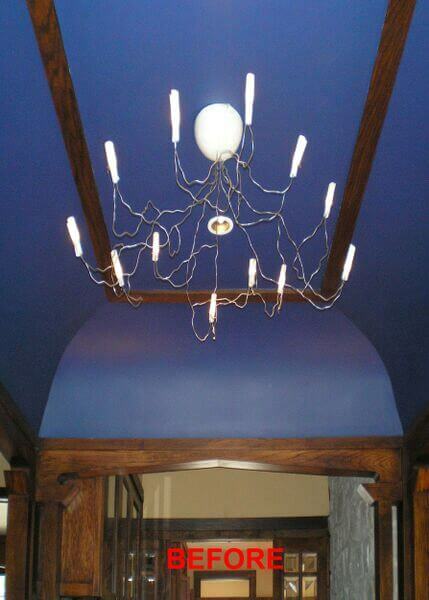 The wonderful light fixture compliments the total effect of the space perfectly! 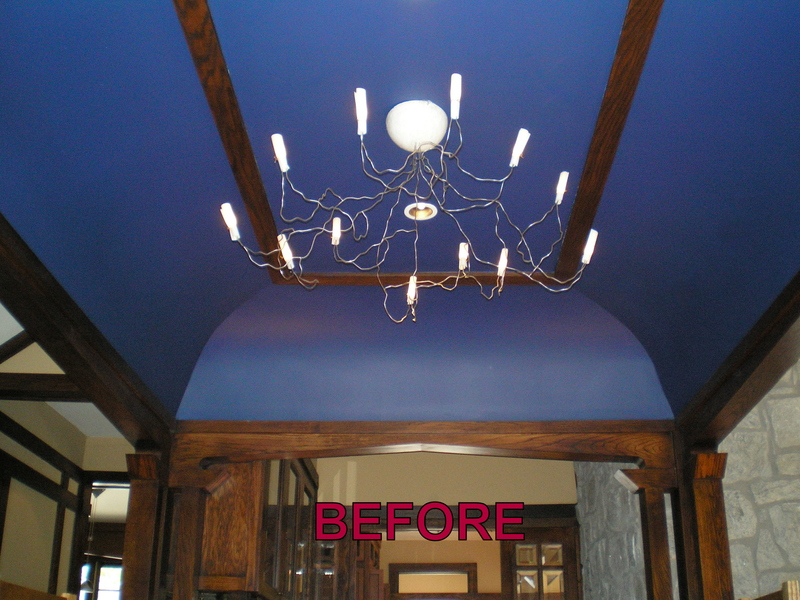 Kass, Wonderful transformation of the ceiling and your work there really helped the room become complete. Amazing! 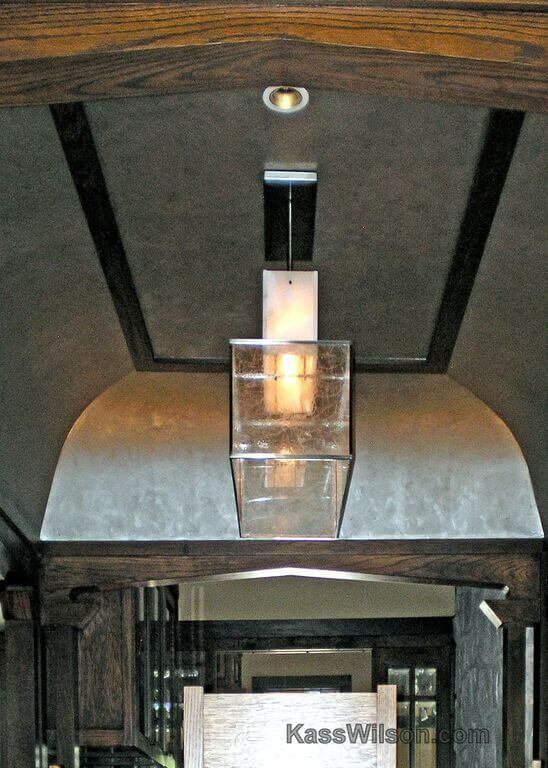 Absolutely amazing h ow you captured the essence of the Arts & Crafts movement, from the texture, down to the light fixture. Clean lines, Baby! Amazing! You are wicked talented! Kass- you really out did yourself (is that possible?)! Everyone is describing your new online look as “amazing” so I will say SPECTACULAR! Loved your comment: “Good designs follows the trends. GREAT design sets the trends.” You are a trend setter! You captured the essence of Art & Crafts beautifully! How talented you are!